Hello friends! I have something exciting happening with the release of the brand new 2017-2018 Stampin' Up! Catalogue! I'm introducing ribbon shares! Eeek! What is a ribbon share, you may be asking? 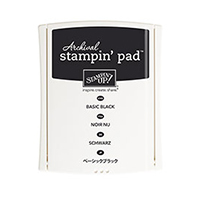 It's the best way to get a whole lot of Stampin' Up! ribbon for a fraction of the price. Instead of buying a roll in every colour - 10 yards of each! 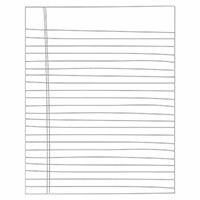 - you can order a fifth of a roll and pay a fifth of the price, and get every colour available. It's that simple! 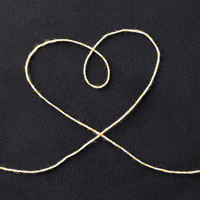 This first round of ribbon shares is ONLY available until June 10th. Orders must be received and paid for by NOON on June 10th. Orders are accepted for anyone Canada-wide, and can be picked up from me in SE Calgary or shipped for a small fee. 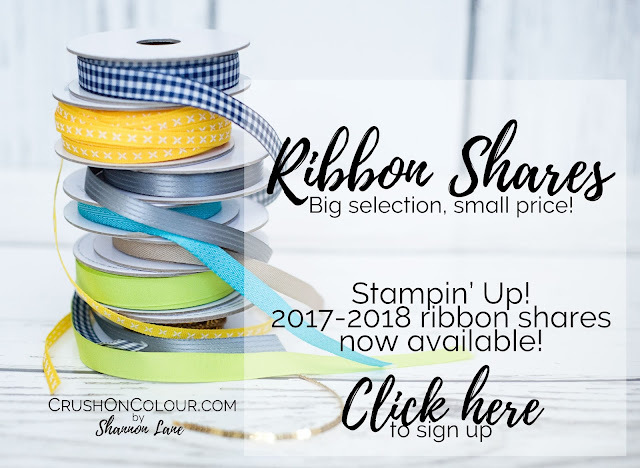 Click here to view the details on each type of ribbon share and prices - and sign up ASAP to reserve your spot, as spaces are EXTREMELY limited! From top to bottom: 1/2" Gingham Ribbon in Night of Navy, 1/4" Double-Stitched Ribbon in Daffodil Delight, 3/8" Stitched Satin Ribbon in Basic Grey, 3/8" Mini Chevron Ribbon in Bermuda Bay, 3/8" Classic Weave Ribbon in Crumb Cake, 1/2" Finely Woven Ribbon in Lemon Lime Twist, and (barely peeking!) Mini Sequin Trim in Gold. We are just TWO sleeps away from the new Stampin' Up! catalogue, launching on June 1st. Can you believe it?! I'm just aflutter with anticipation! Yesterday was the last of the retiring features - today I wanted to do something different. 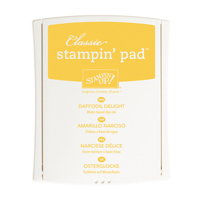 We've spent the whole month of May focusing on what's leaving and what's coming, but there's a whole other category of stamping supplies that we've neglected - the "staying!" 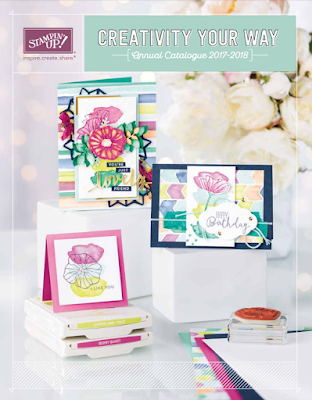 Many of our favourites from the annual catalogue as well as the Occasions 2017 catalogue will be returning, so we have more time to play. Lift Me Up is one of them! 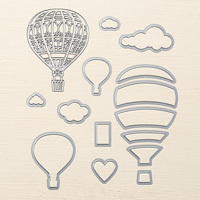 This darling stamp set is packed with hot air balloons and accompanying sentiments, and it even comes with adorable Framelits to coordinate. 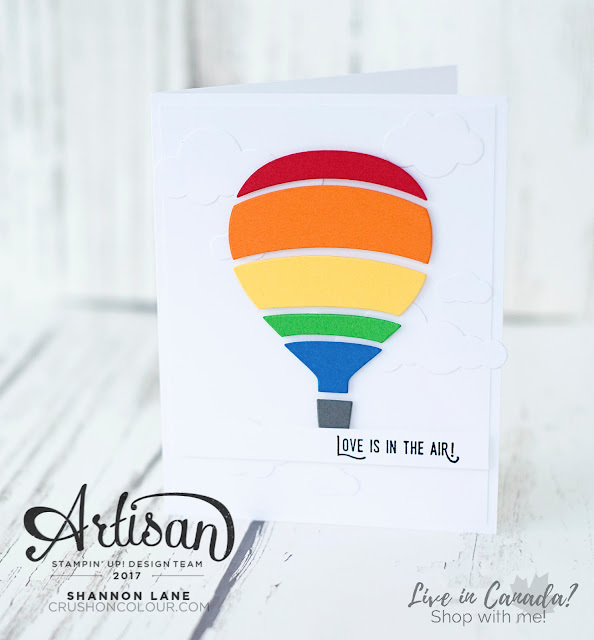 This card uses mostly the framelits to create this simple rainbow balloon. 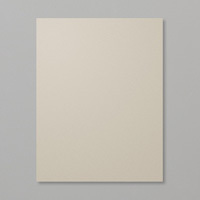 White-on-white clouds in the background are a soft and sweet layer. 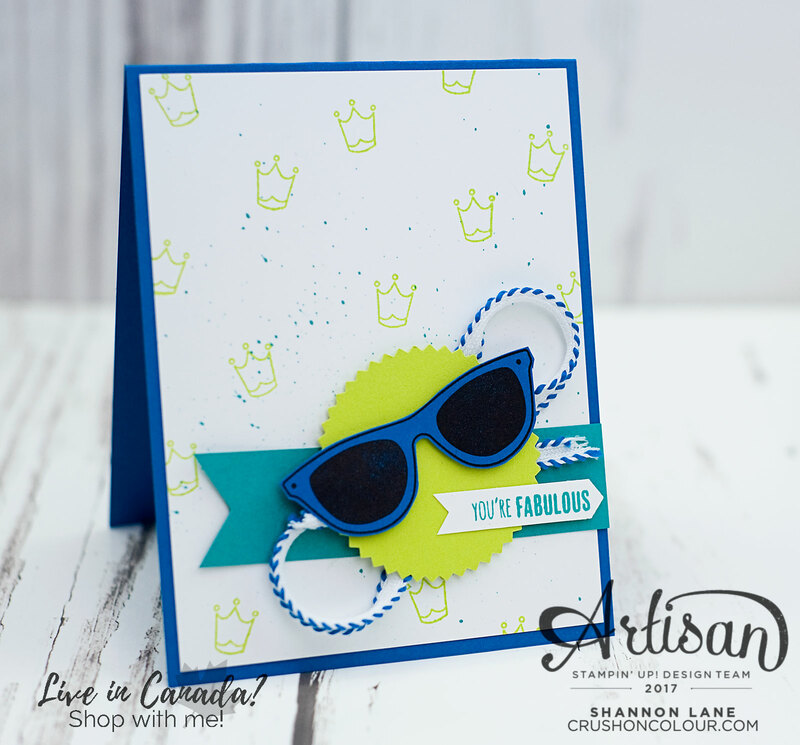 So easy to create with a few cranks of the Big Shot - my must-have tool! I will have one last sneak peek for you tomorrow - gotta whet that appetite for all of the new stuff launching on June 1st! See you soon! 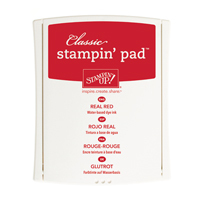 PS - two more days left to use this month's host code in my online Stampin' Up! store for free goodies! to purchase the items used to create this card. Hello friends! 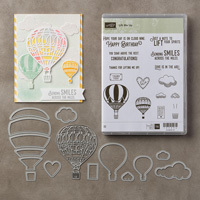 Can you believe the new Stampin' Up! catalogue is only three days away? 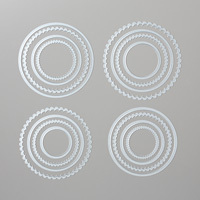 I'm bursting at the seams with excitement for all of the new goodies, and I can't wait to share them with you! Before June, though, we've got to finish up May - and that means I have three more daily blog posts for you! Today will be the very LAST retiring feature - I'll still be posting daily until June, but will be sharing continuing and new items for these last couple of days. A lot of items sold out over the weekend, so you'll want to be sure to shop ASAP if you haven't purchased your retiring must-haves yet. I'd hate for you to miss out! 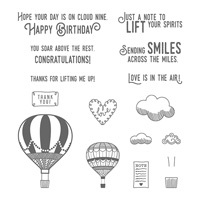 Today is the very LAST retiring feature, and it's one of my favourites - the Scenic Sayings stamp set. This stamp set was first on my must-have list when last year's catalogue came out, and it remains one of my favourites still. 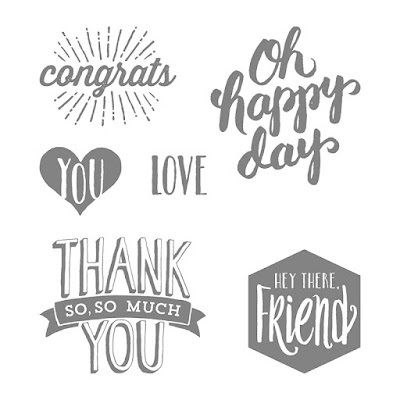 It's a beautiful set of fun, bold sentiments that work perfectly for any occasion. I've paired this sentiment with the Writing Notes background stamp and a fun little graduation cap - complete with tassel! - to make this card fit for any graduate. Unfortunately, in the time between when I made this card on the weekend and posting it today, the Perpetual Birthday Calendar stamp set - where those adorable stars are from - has sold out! Like I said, you're going to want to hurry if there's still items you NEED before they're gone! Speaking of things that will be gone soon - May's host code is expiring on the 31st, just like this catalogue! It's your key to receiving a bundle of DSP, embellishments, and ribbon FREE with your order, so make sure you enter it at checkout in my Online Canadian Stampin' Up! store. Thanks so much for coming by today - and see you again tomorrow! Hello my friends! Another better-late-than-never post - I'm still attached to my sewing machine and hell-bent on finishing the project I started last weekend! I'm doing another sneak peek today, as we gear up for the NEW 2017-2018 Stampin' Up! 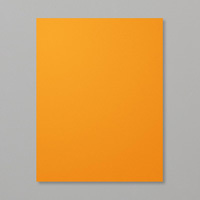 Catalogue - it's right around the corner, releasing on June 1st! 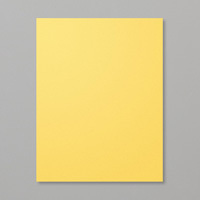 If you don't already copy, please let me know and I'll be happy to get one to you - catalogues are FREE with an order within the last six months, or you can purchase one for $10 and it will come with a $10 credit toward your next purchase. Just let me know - contact details are linked on the right side of my blog! 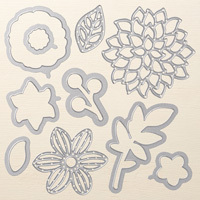 For today's sneak peek, I'm bringing back my new favourite duo: Pieces & Patterns stamp set and Pick A Pattern DSP. 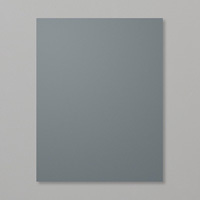 This card is similar to a sample from the new catalogue, with a few little tweaks to make it my own. Isn't it darling? I can't wait to share all of these new goodies with you... just a few more days! 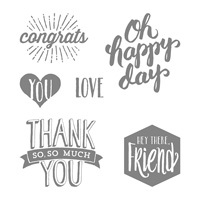 In the meantime, don't forget to hop over to my Online Stampin' Up! Store and browse the retiring items - there's lots of sales to be found, and those items will disappear on May 31st at midnight! 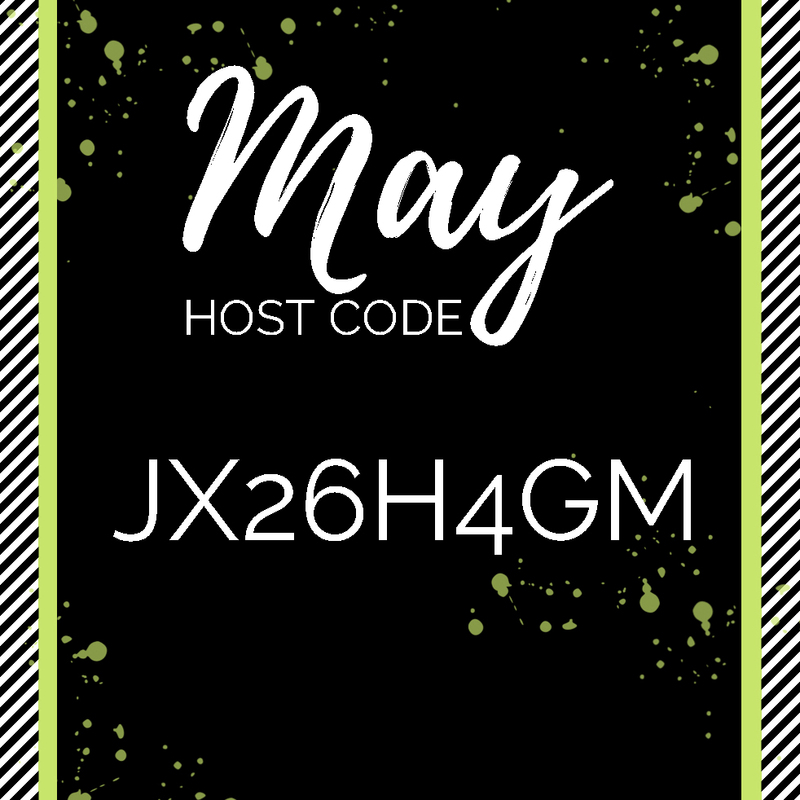 Don't forget this month's host code to receive a bundle of freebies in the mail!